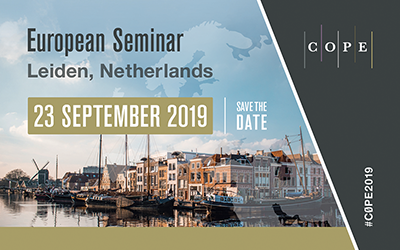 Date for the diary: COPE European Seminar will be held in Leiden, Netherlands on 23 September 2019. As we build the programme the details will be posted here. The May Forum will follow the usual format where members' cases are presented for discussion and advice from all those participating in the Forum. The 2019 COPE North American seminar focuses on inclusivity and diversity in the humanities and social sciences and takes place in Philadelphia, USA. 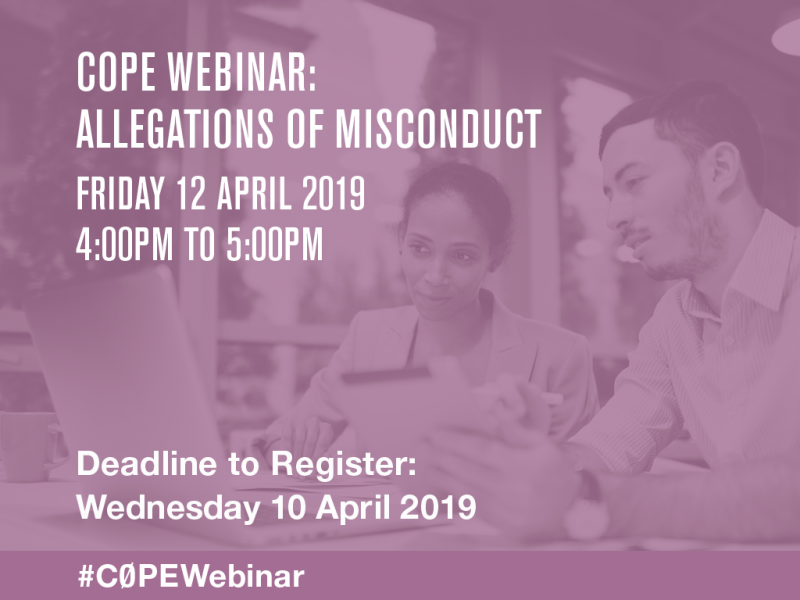 COPE is hosting an hour long webinar around the theme ‘Allegations of misconduct’, on Friday 12 April 2019, 4-5pm (British Summer Time). This is a practical course to help you understand your legal and ethical obligations and implement a successful diversity and inclusion strategy in your workplace. Diversity and inclusion have never been higher on the news and social agenda than at present, and this course will help delegates understand what the law requires, and the practical steps they can take to improve inclusion. Register for the next online COPE Forum, Monday 11 February 2019, 4pm-5.30pm (GMT). All members are welcome to join this Forum which will be held by webinar. It follows the usual format where members' cases are presented for discussion and advice from all those participating in the Forum. The Forum Discussion is "Diversity and inclusion in research publishing". ISMPP invites COPE members to attend a special 90-minute ISMPP U educational webinar, Open Access and Medical Publishing, on Wednesday, January 30, at 11 am EST/4 pm in the UK. ISMPP is offering a 10% registration discount to COPE members for its 2019 European Meeting, Scientific Communications in a Fast-Paced World: Fighting Fit for the Future, 22-23 January, in London, UK. Learn more about the meeting at www.ismpp.org/european-meeting, and enter EU19COPE10 in the “Discount Code” field when you register. This special discount applies to Early Bird pricing through November 30, and Standard pricing until December 31. (2) How to increase journal impact. Run with only 25 participants, the course is highly interactive and allows editors to discover solutions for their own journals. It is is ideally suited for newly-appointed Editors-in-Chief, Editorial Board members and senior managing editors.